Welcome to our Hexadecimal to Decimal Converter. This converter will convert from hexadecimal numbers to decimal, or from decimal numbers to hexadecimal (base 16). Our converter will also show you detailed working out so you can create your own worked examples! Here is our hexadecimal to decimal converter which will help you to convert hexadecimal to decimal and decimal to hexadecimal. Our hexadecimal to decimal converter will also show you the formula and working out you need to convert between units. Step 2) Type in the number you want to convert. Step 3) Click the Convert button and the answer will be displayed. This quick conversion table converts hexadecimal numbers up to the value of (10)16 into decimal. To convert a hexadecimal number (base-16) to the decimal (base-10) number system, we need to use hexadecimal place value to add the base-16 value of each digit. In the hexadecimal place value system, each time you move a place to the left, the value increases by a factor of 16. In hexadecimal, the digit values go from zero to 15, with the letters A, B, C, D, E and F representing the numbers 10, 11, 12, 13, 14 and 15 respectively. This table above shows the number 4C50E in the hexadecimal number system. We can also write this as (4C50E)16. 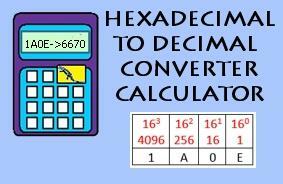 1) Convert 2c7 from hexadecimal to decimal. Step 1) Write down the place value of each digit. Step 2) Add up the place value of each digit. So 2c7 in hexadecimal is equal to 711 in decimal. 2) Convert 1a7d from hexadecimal into decimal. So 1a7d in hexadecimal is equal to 6781. To convert a decimal number (base-10) to the hexadecimal (base-16) number system, we need to change the decimal base-10 place value into hexadecimal base-16 place value. We can do this in different ways by using division and looking at quotients and remainders. The best way to see this is to look at some worked examples . Example 1) Convert 330 from decimal to hexadecimal. Step 1) Look at what hexadecimal place values we need. Our value is just 330, so the powers of 16 we need are 1, 16 and 256 (up to 162). Step 2) Divide 330 by the highest place value number. The quotient tells us what number goes into with the place value of 256, which is 1. Step 3) We now divide the remainder by the next (lower) power of 16. The quotient us what number goes with the place value of 16, which is 4. Step 4) Divide the remainder by the next (lower) power of 16. This tells us which number goes with the place value of 1s which is A. Step 5) Put your place value parts together. Our number 330 = 256x1 + 16x4 + 1x10. So our hexadecimal answer is 14A. Example 2) Convert 8637 from decimal to hexadecimal. Our value is 8637, so the powers of 16 we need are 1, 16, 256 and 4096(up to 163). Step 2) Divide 8637 by the highest place value number. The quotient tells us what number goes into with the place value of 4096, which is 2. The quotient us what number goes with the place value of 256, which is 1. Step 4) We now divide the remainder by the next (lower) power of 16. The quotient us what number goes with the place value of 16, which is 11 (or B in hexadecimal). Step 5) We now divide the remainder by the next (lower) power of 16. The quotient us what number goes with the place value of 1s, which is 13 (or D in hexadecimal). Step 6) Put your place value parts together. Our number 8637 = 4096x2 + 256x1 + 16x11 + 1x13. So our hexadecimal answer is 21BD. Take a look at some more of our resources similar to our mm to inches conversion calculator. Our number system converters will convert numbers from binary, octal or hexadecimal into decimal (or from decimal to binary, octal or hex). The calculators also show you detailed working out so you can see how to do it yourself! Here are some of our specific online calculators for converting between two units of measure. Our prime number calculator will help you to find all the factors of any given number and tell you whether or not the number you are looking at is prime or not. The calculator will also show you your number as a product of primes. If you want to learn more about hexadecimal numbers, take a look at this article in the kiddle encyclopedia! The article talks about the history of hexadecimal numbers, hexadecimal arithmetic and has some other facts too! Using the link below will open the kiddle webpage in a new browser window.